42 political parties for Kano state North West Nigeria under di Coalition of United Political Parties (CUPP) don reject di result of di re-run govnorship election wey happun on March 23. Di state CUPP chairmo Mohammed Abdullahi-Rahi tell tori pipo for Kano say magomago, katakata sara di election wey di Independent National Electoral Commission do. According to am, jaguda pipo work wel-well dat day, intimidate voters for almost all di polling units wia di re-run happun. Im also tok say some pipo lose dia lives why vote buying and oda wuruwuru full ground too. "E clear say di violence wey happun on March 9 wey lead to di cancellation of results for some polling units no reach wetin happun on March 23, yet INEC do like say dem no see as dem accept and announce di result. 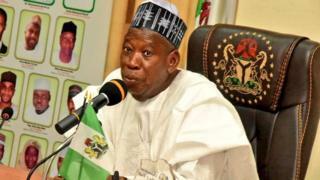 "We reject di declaration of Abdullahi Umar Ganduje as govnor elect for di just concluded March 23 re-run election for Kano becasue of di wuruwuru wey happun before, during and afta di elections. Opposition People's Democratic Party chairmo for Kano Rabiu Bichi bin ask INEC to cancel di rerun on Saturday for Kano as cases of political thuggery and no voting full everywhere. Bichi for press conference wey e hold wit media pipo add say if INEC no cancel dem go pursue di mata for court because Kano pipo don show say na dem (PDP) dem want.